After spending close to two hours at Leelanau State Park and the Grand Traverse Lighthouse Museum, we started to head back towards Suttons Bay for lunch. Before we left the park, the family we were traveling with said they wanted to stop somewhere and get apples. I had remembered seeing a sign for a farm not too far down the road. I was leading the way and sure enough, about seven miles down the road, I found the farm I was looking for. 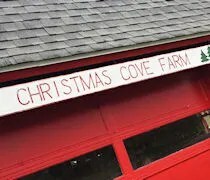 Kilcherman’s Christmas Cove Farm is a little less than a mile from the northern edge of Northport. The four generation farm was advertising “antique apples” which meant nothing to me. At first I thought it was “antiques, apples” like you could buy antiques and apples in the same place. The farm is located just north of the corner of Woolsey Lake Road and Kilcherman Road. If you’re coming from the south, County Road 640 turns in to Kilcherman before Woolsey Lake Road. There’s kind of a weird intersection there, but that’s where the sign that got my attention on our way to the state park is located. 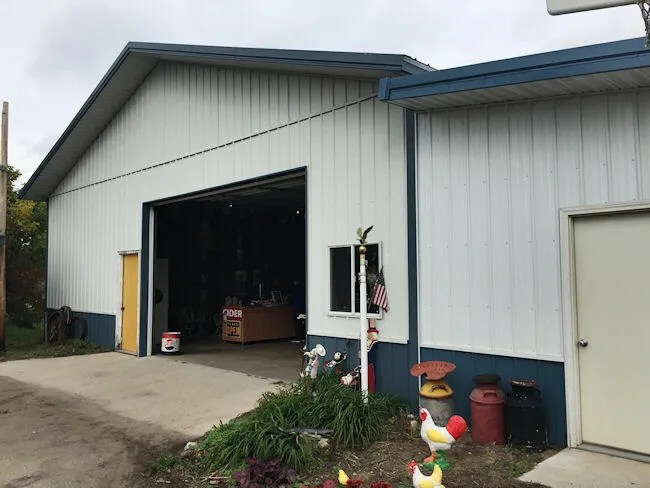 The retail side of the farm is a large metal barn next to the house. There isn’t much parking on this little farm and cars were parked where ever they could fit in. I pulled up and parked in the driveway and our travel companions did the same. In all honesty, I had no intention of blogging about this place when we stopped, but that changed as soon as I got out of the car. This is a really unique operation and unlike anything I’ve ever seen before. The retail outlet is set up very simply with tables throughout the large barn. There are rows and rows of apples of all different colors, shapes, and sizes. I went in with J’s friend who was traveling with us while everyone else stayed in the cars. After a couple of seconds, we both looked at each other and said there were so many apples we had never heard of. Kilcherman’s grows 250 varieties of apples. 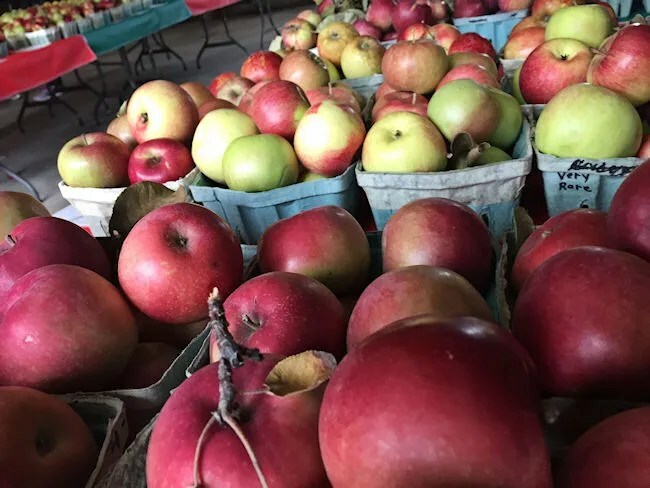 They have all your regular ones such as the honeycrisp and the golden delicious…but they also have an amazing amount of apples you have never heard of or haven’t heard of in a long, long time. They have apples that haven’t been grown here in bulk in decades or even centuries. There are even apples from other countries that aren’t grown in the U.S. and apples from other areas of the country that aren’t grown in Michigan. John The Appleman did his homework in tracking down growing techniques and rare apples from all over the globe to make available at this tiny Northern Michigan farm. Huh…that last sentence sort of made it sound like I was wrapping up this blog post. Well, that would be a good way to end if we were just talking about apples, but wait, there’s more. 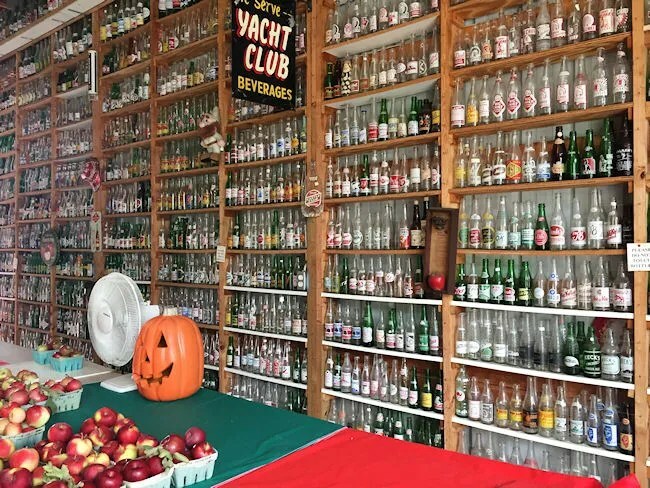 In addition to the large variety of apples grown on this farm, there is also a huge glass pop bottle collection lining the walls of the barn. I didn’t even notice the apples at first as I was in awe of all the pop bottles on the wall. 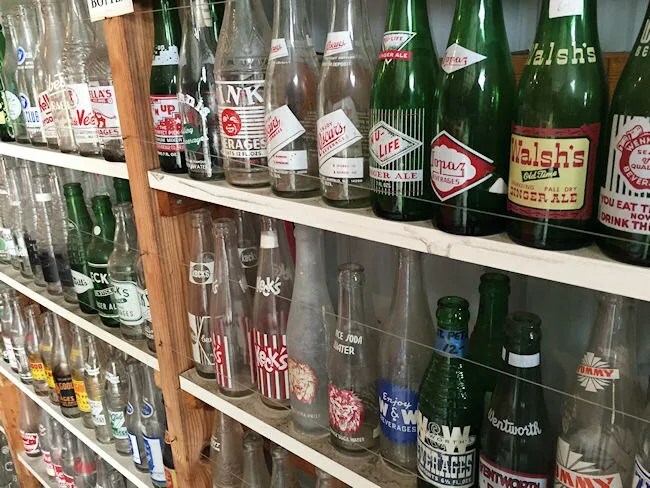 Kilcherman’s claims there are over 10,000 glass pop bottles in the collection calling it the biggest in the world. They point out it’s bigger than the official record in the Guiness Book of World Records, but don’t say why theirs isn’t in the book. Luckily for me, the Record-Eagle did a story on his collection. It’s because he doesn’t want to do the paperwork. He would have to document each bottle in the collection. The Guiness record is 6500. It’s actually quite amazing and you could spend hours just looking through all the bottles that line the walls floor to ceiling. As I was taking a picture, I noticed there is another room off to the side that is full as well….so there’s more than just the barn space. 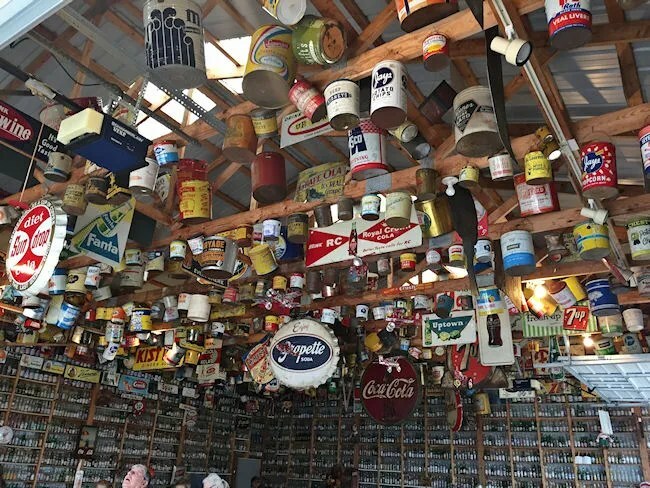 The last thing that really makes this place unique is tins and signs that hang from the rafters. This collection isn’t nearly as big as the pop bottles, but still cool and I bet a lot of our parents and grandparents would find some familiar advertisements hanging from this ceiling. So, I actually feel a little bad because I didn’t actually buy anything….the lady we were traveling with did though, so I don’t feel too bad. I just got out of the car to look around and boy, am I glad I did. 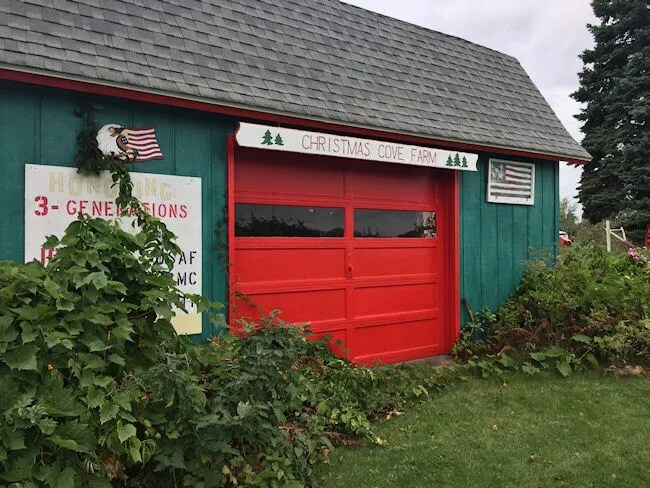 Kilcherman’s Christmas Cove farm is a nostalgic stop that you have to make if they’re open when you’re driving through the Leelanau Peninsula. 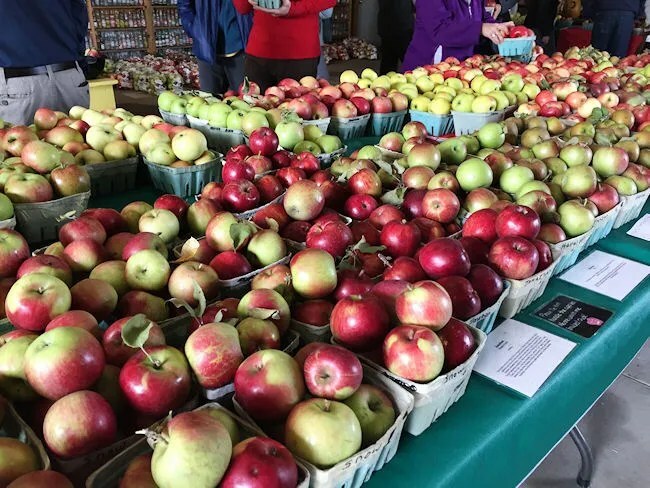 Buy some apples and take a trip down memory lane….this place has all quaintness and country charm most people look for when traveling in northern Michigan. web and on web I found this ԝebsite as a best site fоr newest updates.